National Newspaper Week is well underway! Thank you to all the newspapers who are supporting this ground-breaking initiative! Help keep the momentum going by considering some of the following ideas. Have YOU pledged your support for newspapers? 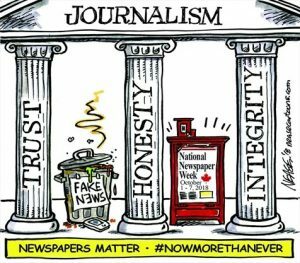 We need everyone … publishers, editors, journalists and all other newspaper staff to go to www.newspapersmatter.ca and show some love for newspapers. Take 30 seconds to add your name, email and postal code to the list online – and then check your email to receive future communications on supporting the industry. It is not too late to support the national ad campaign! If you didn’t sign up to donate ad space but still want to run the creative you can download the ad material from our site here. There are full and half-page ads, as well as two digital ad formats (leaderboard and big box). And if you want to re-size the material the source files are also available to download at the bottom of the webpage. You can engage your own social media followers by posting about National Newspaper Week on Facebook, Twitter or Instagram. Encourage your friends, family and followers to pledge their support online at www.newspapersmatter.ca. You can post a photo of yourself reading your newspaper or the NNW logo with the pledge site URL. Get creative and come up with ways to promote your newspaper and the industry to your community! Send a copy of your newspaper to the Minister of Canadian Heritage, Pablo Rodriguez with a personal note, thanking him for supporting our National Newspaper Week project with funding through the Collective Initiatives component of the Canadian Periodical Fund. Mail sent to Parliament Hill requires no postage so click here to find the address and send some local news to the Hill. It doesn’t end with National Newspaper Week. The Newspapers Matter online hub will remain active indefinitely, so keep promoting the site along with #NewspapersMatter and #NowMoreThanEver. And don’t forget to check us out on Facebook, Twitter and Instagram to see what others are saying about National Newspaper Week! The Publisher’s Toolkit is available online here with ideas and material to support local promotion of National Newspaper Week.